Wacom extends the Cintiq Pro lineup with a new high performance mid-sized display built for cutting-edge creative and design applications including augmented and virtual reality. The Cintiq Pro family now features a range of sizes to meet the unique workflow and configuration needs of creative professionals. 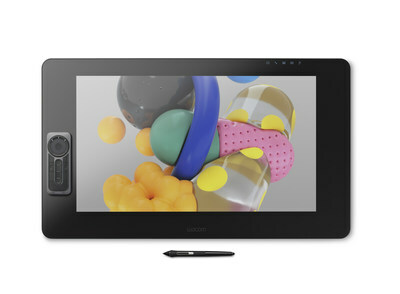 TOKYO, Feb. 27, 2018 — (PRNewswire) — Today Wacom announced the availability of the Wacom Cintiq Pro 24 pen display, expanding the Cintiq Pro high-definition range, which is designed for creative professionals seeking a larger digital canvas and the power to tackle an increasing onslaught of creative applications and programs. The new 24-inch Cintiq Pro pen display joins the previously introduced 13 and 16-inch models to form a comprehensive range of sizes for every need and workspace. The pen and touch display version will be available in May, the earlier announced 32-inch model is slated for later this year. "We know that professional artists and designers are facing an increasingly vast array of computing and display demands as they embrace emerging technologies like augmented and virtual reality, and 3D, where one size doesn't fit all," says Faik Karaoglu, Executive Vice President for the Creative Business Unit at Wacom. "Everyone has their own way of working, and we are excited to offer larger sized digital canvases with flexibility that provides more pen space for those who need it to create." With the Wacom Cintiq Pro Engine (also announced today), a Windows 10 computing module, featuring the new NVIDIA ® Quadro ® P3200 high performance graphic card, that slides into the back of the Cintiq Pro 24 display, creative professionals can easily transform their Cintiq Pro 24 into a high performance creative workstation fully supporting state of the art applications and workflows, including 3D, animation and augmented and virtual reality. The Cintiq Pro 24 pen display models are available in the U.S., Japan and selected European countries as of March; for further details visit our e-store at Wacom.com. Prices ranging from $1,999 to $2,499. The Pen & Touch version of Cintiq Pro 24 will be available in May 2018 and finally the also announced Cintiq Pro 32-inch model is slated for later in 2018 due to a couple of unexpected supply chain issues. SOURCE Wacom Technology Services, Corp.
Company Name: Wacom Technology Services, Corp.
Financial data for Wacom Technology Services, Corp.